The best part is that an investor gets price appreciation and earns interest income as well, which is unique only to a sovereign gold bond. If you are planning to buy gold on Dhanteras, opt for the Sovereign Gold Bond scheme slated to launch on the same day -- November 5. Among all the options for investing in gold, investment advisors prefer the SGB. It is one of the cheapest ways to invest in the precious metal. "The best part is that an investor gets price appreciation and earns interest income as well, which is unique only to the SGB," says Ajay Kedia, director, Kedia Commodities. There will be one tranche every month until the end of the financial year 2018-2019 (please see table). Each tranche will be open for subscription for five days. These are substitutes for holding the metal in physical form. These bonds are issued in denominations of one gramme of gold and in multiples thereof. The maximum limit of subscription is 4 kg worth of gold per individual in one financial year. In the case of joint holdings, the limit applies to the first applicant. These bonds also offer an annual interest rate of 2.5 per cent on the initial investment amount. The interest is credited semi-annually to the investor's bank account. On maturity, the individual receives the current market price of the yellow metal. The bonds mature after eight years, and early redemption is allowed after five years. "The only problem is that the issues are not on tap. 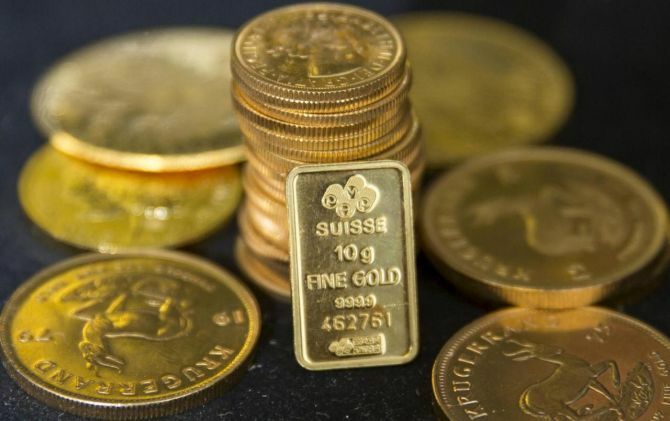 When a person wants to buy gold, there's a possibility that the SGB is not available. In such cases, exchange-traded funds are the next best option," says Malhar Majumder of Positive Vibes Consulting & Advisory. Pros: The benefits of SGBs are attractive interest income -- 2.5% of the initial value to be paid every year -- along with asset appreciation opportunity. Redemption is linked to gold prices. There is 100% elimination of risk and cost of storage. Also, SGBs are exempt from capital gains tax, if held till maturity. Cons: If an investor wants to exit early (before five years), s/he has the option to sell these bonds on the stock exchanges. But liquidity is low on the exchanges. Buyers also seek these bonds at a discounted price on exchanges. To make physical gold more attractive, players such as Paytm and the Stock Holding Corporation of India nowadays offer 'digital gold'. With Paytm, you can buy gold for as low an amount as one rupee. With SHCIL, the minimum investment amount at the time of application is Rs 1,000 and in multiples of Rs 100. A copy of the PAN card will be required if the amount is equal to or more than Rs 50,000. The buyer can ask for delivery of physical gold once s/he accumulates at least one gram of the precious metal. While Paytm allows you to sell the digital gold back to the company, with SHCIL you have to take delivery compulsorily. The best part is that you can buy gold at any time of the day. Pros: None of the two companies has any storage charges. This works out to be a better option for those who are planning to buy physical gold at a later date. Cons: Not preferable for investors. There are making charges and also taxes when the individual takes delivery. You will also see that there is a difference between the buying and selling price at Paytm. Gold Exchange Traded Funds (ETFs) are primarily paper gold. The money you invest will be pegged to 24 carat gold. The underlying asset is gold and some cash. To invest in these ETFs, you need to open a demat account. One unit of ETF is equal to one gram of gold and is held in electronic form. When you redeem, you don't get physical gold. You will get the monetary equivalent of the price of gold on the day of redemption. ETFs have two costs -- expense ratio and the cost of opening a demat account. Usually, the expense ratio ranges between 0.18% and 1.18%. Pros: No storage cost. Highly liquid. Cons: If a person opens a demat account only for ETF, there will be annual maintenance charges. One of the easiest ways to invest in the yellow metal. However, you should be cautious as its resale value is comparatively lower than that of gold bars and coins. An individual also needs to pay a premium (commission and making charges) over the prevailing market rate. Purity is another big issue with jewellery. Stick to hallmark certified gold jewellery only. Pros: Easiest to buy and sell. Cons: Additional storage cost. A person pays more than the prevailing market price when s/he buys and gets less when he sells.